Wind slight south-west, humid low cloud cover with periods of prolonged sunny spells. Paul Crawley saw a male and female Bullfinch on the marsh side of the motorway bridge at Marsh Lane. 4 Avocet, 3 Black-tailed Godwit and a single Yellow Wagtail were all on No 6 tank. Paul also received a text from John Gilbody who had seen 2 Short-eared Owls on the evening of the 29th. Interesting to find birds still present here, it makes you wonder? Common Whitethroat is a typical summer visitor to Frodsham Marsh and their scratchy song is evident on these warm summer evenings. Image by Paul Crawley. A young male Fox prospecting again for nesting birds but was given short sharp shrift from the nesting Black-headed Gulls and was sent packing. Managed this image of my first Painted Lady Butterfly of the year sunning its self on the raised bank of No 6 tank. 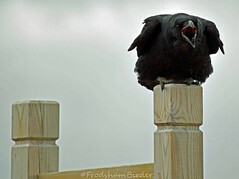 Paul Crawley sent me this image and message about the Raven featured below. I got these shots of the Raven yesterday showing its nictitating membrane. You can find more of Paul’s photographs on the Birdguides website gallery. Just up the road from Frodsham is Riverside Campus off Percival Lane, Runcorn docks, I found a new site for Bee Orchids with well over 50 in flower. Evening visit. Wind warm moderate from the north-west. Bright and sunny. 1 (male) Marsh Harrier, 9 Dunlin, 4 Avocet, 7 Black-tailed Godwit (including the ringed individual from previous weeks, now with a broken leg), 40 Mute and a single Black Swan, 100 Tufted Duck, 25 nesting pairs of Black-headed Gull, (singing) Cuckoo, 1 Yellow Wagtail . The photograph below of either the ‘Tulip’ or ‘Royal Daffodil’ Mersey ferry travelling along the Manchester Ship Canal twice weekly from Liverpool during the summer months. Although the image looks like the boat has run aground. It is really sailing along the canal but, sandwiched between the (north) raised banks of Frodsham Score and the Marsh Farm fields (south) in the foreground. The ferry enters the ship canal at Eastham locks on the Wirral and travels to Salford Quays, returning the following day. If you’re looking for a budget cruise with really close views of Frodsham Score, Runcorn Bridge and Wigg Island then contact the Mersey ferry company online (there’s even a bar onboard!). A return coach is available at the end of the line. The last time I saw the price list it was £37.00 per adult. 26.05.12. Nature Notes (…and so it begins!). …our little friends the Spindle Ermine Moth caterpillars are beginning to munch their way through the Spindle bushes along the top track on No 6 tank today. Watch this area over the next few weeks. …and ends like these two pictures below taken in 2010. All from a little Spindle Ermine Moth caterpillar which grows to one of these critters. Bright warm sunny weather with a refreshing strong Easterly wind. Clear skies and good visibility. 2 Black-tailed Godwit, one of which is the ringed bird from late April. It appears to have a swollen knee-joint and is hopping whilst feeding. 4 Avocets, 8 Dunlin, 1 Little Ringed Plover, Whimbrel calling, 49 Mute Swan and the Black Swan present. Pair Pochard, drake Wigeon, 100 Tufted Duck, male Marsh Harrier, 2 Buzzard, Sparrowhawk, 4 Raven, 2 Cuckoo, 2 Yellow Wagtail. Included below is an account of John’s visit to the marsh and his observations and comments. It certainly was John and it started with me and Martin Garner manually digging a huge hole at the base of the drainage brick tower on No 1 tank in December 1986, to cement the wooden post and box there. It was later relocated to its present site at the south-east corner of No 5 tank. A male Wigeon with 102 Tufted Duck, 42 Mute Swan and 1 Black Swan were present on No 6 tank. The flooded area supported 1 Black-tailed Godwit, 1 Redshank, 3 Avocets, and 4 Dunlin. A lesser Whitethroat was singing from trees at the ramp track to No 6 tank.